Betty Ford was known for many things, some of which are: activism, First Lady of the United States of America, and alcoholic. While the latter may sound unappealing to a number of people, for those whose lives were touched and in some cases saved by Betty, it is a big deal. She was one of the first people in the public spotlight and political arena to speak openly about her affliction and after finding recovery herself she made it her personal mission to help those in need find it, too. Even in death Betty Ford is still helping people in recovery, Mary Pattiz, chairwoman of the board at the Betty Ford Center in Rancho Mirage, said Wednesday $400,000 was a direct bequest to the center, as well as another $100,000 from a foundation set up by Ford and her late husband, President Gerald Ford, according to The Desert Sun of Palm Springs. "Mrs. Ford was, and always will be, the heart and soul of this place of healing," Pattiz said. "It means so much to us that after all she had given over the past 30 years, the center was still front and center in her mind during her final days." The drug treatment facility that Ford co-founded has help over 100,000 people start the road to recovery. It was designed to open the door of treatment for addicts and then would help patients find a suitable extended care facility after 30 days. With the skills patients gained in the first thirty in their tool box, it made what was required to live and prosper in recovery a reality down the road. 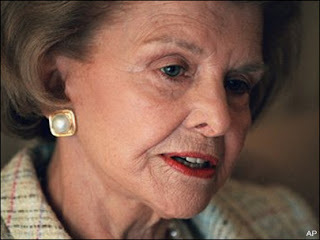 The entire addiction community owes Betty Ford their gratitude and admiration.